There are a handful of 'Magic Roundabouts' in the UK -- Ring Junctions to give them their real name -- that are made up of five mini roundabouts inside a larger one. They sound incredibly confusing and terrifying -- and have been voted some of the worst and scariest roundabouts in the country -- but the truth is these systems are some of the safest on the roads, due to their complexity. Even so, it can be a daunting task for some new to the area to try and circumnavigate these cricles within circles. It has been voted as one of the worst junctions in the UK. It has also been voted as one of the scariest, and to people unused to using it, it can certainly seem confusing and terrifying to say the least. 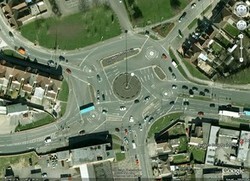 It is Swindon’s ‘Magic Roundabout’ – a large roundabout with five smaller ones built within it. It was a design created by Frank Blackmore, creator of the mini-roundabout. It was a design that was fine turned even as motorists were using it, as the five smaller circles were not properly marked out upon its initial opening. To help traffic figure out this complex system, five policemen were stationed at each roundabout during its ‘testing’ stage. Contrary to other roundabouts, the traffic flow around the middle circle is actually anti-clockwise, with the smaller ones being the standard clockwise. Roundabouts themselves were created in order to ease congestion. Instead of one lane of traffic slowly building up while waiting to turn, there could be a largely continuous movement around the circle. This system may seem stupidly complex, but it is the most efficient method that could be implanted in a space of that size and minimises the risk of accidents and personal injury. A normal roundabout would create long queues; traffic lights would amount to the same, and with the added insult of enforced stoppages. Drivers are advised to not worry about the whole system, instead dealing with each mini-roundabout as they normally would as they come to it. Indeed, the set-up is very safe – the traffic moves slowly around it so if collisions do occur, the vehicles are moving too slowly to cause fatal accidents. It is not completely unique either, as there are other ‘Magic Roundabouts’ in Colchester, Hemel Hempstead and Sadler’s Farm near Southend, with the similar set ups of five small roundabouts inside a larger one. These were built after the initial excitement at seeing the Swindon Ring Junction – the official name of these systems – working so well. Since then, however, the interest has waned. The ones that were built are still in good working use and the Swindon Roundabout has stayed consistently traffic jam light, even though vehicle use has grown a great deal in the last forty years. The Swindon Magic Roundabout even inspired a short film by artist and filmmaker Tom White and dedicated to Frank Blackmore. The film is rather hypnotic, with lingering, angled shots of cars moving around the roundabout accompanied by odd music, and interspersed by interviews with locals. We went round that roundabout in Swindon the other day. I don't drive and was a passenger but it looked completely baffling!